The Ranger is Aliner’s most versatile model since it is available in three different size configurations. Each of these sizes comes with the same basic equipment and offers the same options. The smallest Ranger can be seen as a step up from the Scout, while the larger models lack some of the equipment and features that you see in the Classic and Expedition models. If you’re making the move from tent camping to a pop up camper, but you want something a little more substantial than the Scout, then one of the Ranger models might be a good fit. On the other hand, the Ranger is also a good choice if you’re not looking for all of the bells and whistles that you get with the Classic and Expedition. The Ranger is available in three different lengths. Ranger 10 12'8" 78" 200 lbs. 1,200 lbs. 2,100 lbs. Ranger 12 15' 78" 150 lbs. 1,320 lbs. 2,100 lbs. Ranger 15 18' 84" 220 lbs. 1,800 lbs. 3,000 lbs. Available options for the Ranger include the “off road package” in addition to a number of ala carte items. The off road package boosts the GVWR of each base Ranger model and adds bigger tires. 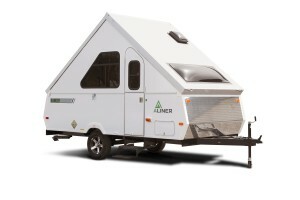 Due to the beefier axle and bigger tires, campers with the “off road package” are a little wider than those that don’t have it. 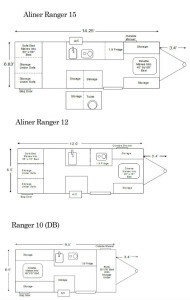 The Ranger is available with in three lengths and four floor plans.